There are self-guided brochures but the best way to feel its elegance and place in history is to take a guided tour. Check ahead for times then purchase tickets half an hour before the tours start. Ordered by Napoleon III during the Parisian reconstruction project when Baron Haussmann turned streets into boulevards, the opera house was designed by Charles Garnier and built from 1860 to 1875. And yes, it looks like a palace. Pretend you are among Parisian high society and walk up the Grand Staircase. 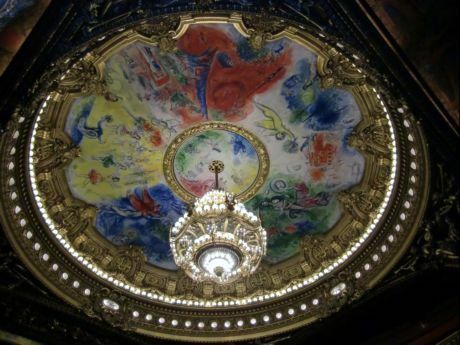 The ceiling mural by Marc Chagall depicts famous operas. A chandelier similar to this one did fall. Your guided tour ticket allows you entrance into the orchestra level. Look up to see the ceiling Marc Chagall did that covers the original classic mural. Look up to the dress circle level and left for the phantom’s box. The large chandelier weighs eight tons. As in the “Phantom” a similar chandelier is said to have fallen and killed someone. 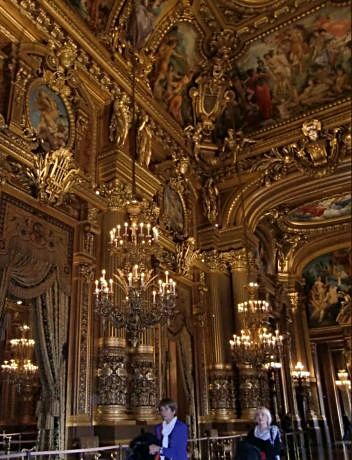 Take a break where society showed off their gowns and escorts in the Grand Foyer reminiscent of Versailles. When done, you could find a sidewalk café but after the elegance of Palais Garnier you should treat yourself to an espresso, tea or cocktail across the street at Le Grand Hotel InterContinental. An impressive Grand Foyer is where Parisian high society mingled between acts. 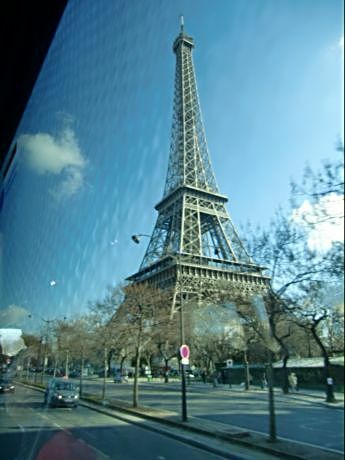 Its large atrium is the restaurant La Verrière, a gathering place for business and a place to relax after touring Paris. French macaroons (not at all like American macaroons) are yummy and come with coffee and tea. Nuts and olives come with cocktails. Or order lunch. The food is delicious and comes from the same kitchen as the hotel’s famed Cafe de la Paix. Pair the two: the Palais Garnier and Le Grand Hotel for a Parisian treat.